You likely already know that Chevron (as Texaco) admitted to deliberately dumping close to 18 billion gallons of toxic foundation waters into the pristine Ecuadorian Amazon over several decades (1964-1992). The company split from Ecuador in 1992, conducted a "remediation" proven to have been a complete sham, and got a $40 million "get out of jail free" card from the government of Ecuador (which specifically did NOT exempt them from any third party action). The results of their malicious acts to save just a few dollars per barrel? A wave of cancers and birth defects (incidentally, a Texaco engineer estimated in the 60's that about $4 million would cover the costs of building industry-standard lined waste pits but Texaco thought that was too costly) and a horrific health crisis that continues to this day. In what is one of the most unlikely and significant victories in environmental and human rights history, 30,000 indigenous people and campesinos won a $9.5 billion judgment in a class action suit after 20 years of ugly legal battles (now upheld by Ecuador's highest court). Unlikely because of the unprecedented and overwhelming pressure placed on the plaintiffs, their supporters, Ecuador and the Ecuadorian judicial system. And significant as it sets an encouraging precedent that those victimized by powerful corporate forces have hope for justice and a way to fight back. So how on Earth could this victory be so ridiculously, unethically and illegally turned on its head and evolve into the shocking display that just played out in a US Federal Court? And what repercussions and worrisome precedents could such reckless actions hold for corporate accountability and legal processes around the world? I just spent most of the last two weeks in that New York City courtroom, where U.S. lawyer Steven Donziger and the Ecuadorian Lago Agrio plaintiffs found themselves accused of extortion and racketeering by the 3rd largest corporation in America. Chevron's sham trial will wrap up today, but thanks to Kaplan's inexplicable decision not to allow any testimony related to Chevron's contamination of the Ecuadorian Amazon – the actual issue here and disaster from which all this started – there's a lot that will never be discussed in the courtroom. In 2010, before the Lago Agrio court had even issued a judgment (which Chevron now claims was "ghost written" by the legal team for the Ecuadorians), U.S. Federal Judge Lewis Kaplan had already made up his mind about the case. By issuing a worldwide injunction (later overturned by the 2nd Circuit Court of Appeals) Kaplan began a twisted journey through the looking glass and dragged the United States with him. Based on Chevron's trumped-up charges pieced together from edited Crude outtakes and thousands of emails between an international team constantly battling Chevron pressure tactics, Kaplan decided that a fraud had taken place and encouraged Chevron to file a RICO suit. Kaplan has never been to Ecuador, knows nothing about its legal system and didn't even consider key evidence or hold a hearing to determine the facts. He doesn't even speak Spanish. His order, according to Professor Burt Neuborne, an extremely well-regarded human rights and civil liberties lawyer who is also the Legal Director of the Brennan Center for Justice at NYU Law School, "[sent] an unmistakable message of American judicial arrogance to the rest of the world that can only result in increased levels of reciprocal judicial suspicion and hostility, with negative consequences for the transnational rule of law." Forced Ecuadorian citizen Donald Moncayo who appeared as a witness to turn over his computer and all his email within hours of taking the stand or suffer arrest. Permitted testimony from a witness who has received hundreds of thousands of dollars in compensation by the prosecution for his testimony. Each of these pieces of Chevron's scorched-earth legal strategy is part of a specific approach to suppress free speech, scare off supporters, create and expand negative rumors, to divide and conquer the opposition. It's already been criticized by criminal defense lawyers familiar with RICO as a way to "send a message to a lawyer who wants to take up a cause for an underdog that Big Brother, the big corporate entity, is going to start coming after you for criminal conduct." Even with Kaplan clearly on their side, Chevron does still have to do some of the work. There's a significant difference in the law between extortion by force and extortion by pressure. One allows a meritorious claim as a defense and the other doesn't. Yet, if the trial record does not allow for evidence of the reasons Donziger and the LAPs initially filed their suit – the toxic contamination – how can anyone make a judgment on whether their claims against Chevron have merit? Chevron has to affirmatively prove that the LAPs have no right to recovery, yet they never submitted any evidence related to the actual contamination. If you cut through the theatrics that have little or nothing at all to do with the claims, Chevron is left with absolutely nothing more than a triple hearsay statement from an admitted liar and corrupt judge, who was paid more than $300,000 by Chevron for his testimony. There's not a single piece of evidence to prove in even the slightest that Judge Zambrano did not write the verdict. Everything Chevron has introduced has been done so to suggest that something nefarious happened without actually proving the claims. Mix that with Kaplan's attitude towards Donziger and all things Ecuador and you have a show trial and nothing more. Even Kaplan himself appeared frustrated that Chevron's lawyers have not made his task easy by giving him a solid case to base his judgement upon. That is why they dropped the damages claim to ensure no jury would ever hear their case – they'd never swallow it. Nevertheless, most are confident Kaplan will complete the task he set out before the Lago Agrio judgment was even issued – he will hand Chevron a ruling they can tout to anyone who will listen. It's no matter that it will not be based on the facts. No matter that it will not contain any evidence of actual extortion or illegal acts. No matter that it will be used expressly to violate the order of the 2nd Circuit Court of Appeals when they directed Kaplan not to act as an enforcement court. Truth is stranger than fiction. These events would seem too outlandish to be true had I not witnessed them with my own eyes. And that is exactly what Chevron is hoping for. They will use Kaplan's verdict for years to come (though the verdict itself will inevitably be faced with legal problems that will likely cause it to fall apart quickly under appeal), and possibly spend billions more hoping empty words based on lies and manufactured "facts" will drown out the voices of the tens of thousands who continue to live with the harsh reality of Chevron's despicable acts in the Amazon. Judge Lewis A. Kaplan, overseeing Chevron’s RICO trial against Ecuadorian villagers and their lawyers, is suppressing critical witness testimony about Chevron’s extensive contamination of Ecuador’s rainforest that clearly demonstrates a $9.5 billion environmental judgment against the company is valid, a spokesman for the villagers said Monday. “Judge Kaplan is again demonstrating his deep-seated animus toward the Ecuadorian communities victimized by Chevron’s pollution,” said Han Shan, the U.S.-based spokesman for thousands of Ecuadorian villagers who in 2011 won a judgment against Chevron after an Ecuador court found the company dumped billions of gallons of toxic waste onto the lands and waterways of the Amazon. Kaplan’s latest move in the RICO case, which is expected to end tomorrow, was to strike substantial portions of the written witness testimony of Steven Donziger, the New York lawyer who has represented the Ecuadorian villagers since 1993. Donziger, the main defendant in the case, has disputed all of Chevron’s allegations and has characterized the RICO lawsuit as a form of retaliation against those who held the company accountable for toxic dumping. 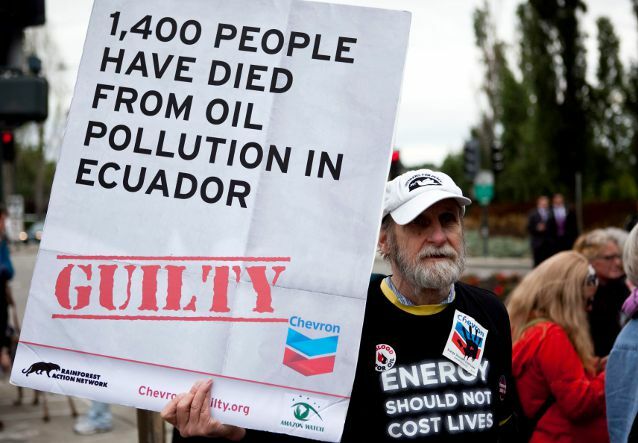 Ecuador’s Supreme Court unanimously affirmed the judgment against Chevron earlier this month. Forbidden by Judge Lewis Kaplan from providing direct testimony on the stand about his two-decade-long involvement in efforts to hold Chevron accountable for its human rights and environmental abuses in Ecuador, Steven instead was ordered to submit a written declaration as his direct testimony. After submitting his statement, last Monday—November 18th—Steven Donziger finally took the stand. The lead lawyer for Chevron in the trial, Gibson Dunn's Randy Mastro, announced that he expected to spend more than a full day cross-examining Steven. Instead, after halting, confused questioning of Donziger during which the perfectly poised witness answered questions in an easygoing, explanatory fashion, Mastro huddled with furrow-browed Chevron company lawyers at a brief break. After the recess, Mastro, looking rattled, announced in open court that he had only a few more questions. He soon beat a hasty retreat before the lunch break, lest he offer Donziger further opportunity to deconstruct Chevron's cynical and deceptive narrative. All in all, the day was a huge victory for Donziger. Donziger's witness statement was submitted to the court but Chevron predictably filed a motion to strike most of it, in an effort to suppress evidence of the company's environmental crimes and fraudulent cover-up in Ecuador. Judge Kaplan granted many of Chevron's motions and struck numerous significant passages in the testimony. Judge Kaplan didn't grant all of Chevron's requests, which would have reduced the powerful testimony to a handful of disconnected floating paragraphs. Click here to read Donziger's complete witness testimony, noting that all of the greyed-out passages are those that Chevron requested be struck, and all of the yellow highlighted passages are those that Kaplan actually struck from the record based on Chevron's motions. Donziger suggested that lawyers on the plaintiff’s team made some minor errors typical in a contentious and long-running litigation, but that those errors paled in comparison to the deeply corrupt acts engaged in by Chevron to sabotage the trial. Whatever errors were committed did not come close to amounting to fraud, as has been confirmed by Ecuador’s courts. Although Judge Kaplan has tried to exclude evidence of Chevron’s corruption, Donziger is trying to bring it in as evidence of his state of mind. Donziger again made it clear – as he did in a sworn declaration submitted to Kaplan’s court last March – that he did not bribe a judge in Ecuador and that Chevron’s star witness who so alleges, Alberto Guerra, is corrupt and a liar. Donziger said Guerra’s testimony is a “massive lie” at the core of Chevron’s case. A motion to strike Guerra’s testimony is pending before the court. Donziger's declaration is a profoundly important summary of the two-decade effort of the rainforest communities to hold Chevron accountable. After reading the powerful testimony, and comparing the grey parts—sections Chevron asked to be stricken—and yellow highlighted passages—sections Judge Kaplan struck from the record—one can be forgiven for thinking that censorship is alive and well in America. It is, and it's being carried out under the guise of a judicial process that Chevron is using to conceal its crimes in Ecuador and retaliate against those that have helped bring them to light. Editor of the Earth Island Journal Jason Mark wrote a story that first appeared in the magazine, and has now been syndicated by Salon. In the article, Mark goes beyond the basic reporting on the back-and-forth of the Chevron v. Donziger trial to explore the broader implications of the oil giant's retaliatory efforts. If he’s right — and Chevron has spent all of this money just to intimidate people and prevent future litigation — then it leads us to a sobering conclusion: Even if the judge rules in Donziger’s favor, Chevron still wins.